6th October : 4:00 pm Add to Calendar 06/10/2018 16:00 06/10/2018 17:00 Asia/Kolkata Opening of "Utsav" group art show Event Page : https://www.delhievents.com/2018/10/exhibition-utsav-group-art-show-uchaan-gold-souk-mall-gurugram.html Uchaan Art Gallery, Gold Souk Mall, Block- C, Sector- 43, Sushant lok, Phase- I, Gurugram DD/MM/YYYY - Inauguration by Shri T D Dhariyal - Commissioner of Persons with Disabilities as chief guest.Shri Dhariyal worked as an exemplary Civil Servant for more than 3 decades in the Ministries of Defence, Home, Shipping and Social Justice and Empowerment. Shri Kalyan Banerjee will conduct a story tell "Suno Sunao Kahani" in his peculiar manner inspiring the artists. Kalyan Banerjee is Author & Artist. 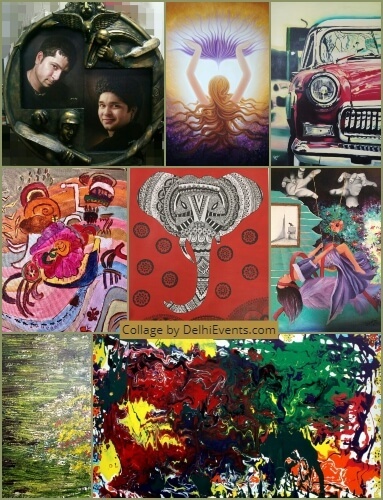 UTSAV'' is a group exhibition of upcoming & establish artists. It is really about how we think about the concept that are cemented into our society. Festivity in our culture means abundance in all aspects leading to happiness. With festive season knocking our doors Uchaan brings in Exhibition UTSAV. The idea is the symbiotic connection between happiness, creativity, art and celebration (Utsav). As Jyoti Kalra the curator says '' it is not enough for the artists to be mere makers. There is a need, she believes to push the artistic envelope and bring in the synergy between art & life. About Organisation : Uchaan Foundation is incorporated as a not-for-profit organization with a foremost intent to promote artists and get their talents recognized by art patrons and be a fostering ground for varied genres of art. It has taken up a role of an incubator by understanding the needs of the artist in the making to focus on work and deepen the artistic specialization rather than to find ways to communicate and connect. Uchaan Foundation is always on the edge of promoting artistic innovation and understanding of contemporary visual arts through a regular incubation programme of exhibitions, workshops, lectures, classes and other similar activities which further complement the purpose of encouraging, promoting, advancing, and assisting art education and instruction.